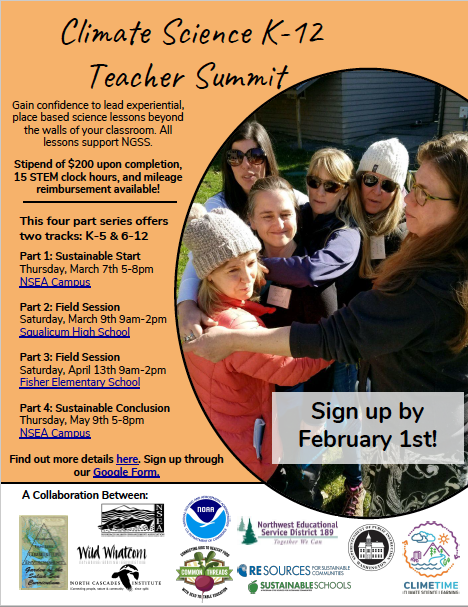 Are you a teacher in Whatcom or Skagit county looking to expand your toolkit? Join six local organizations for a 4-part professional development series focusing on climate science and Next Generation Science Standards. Interactive outdoor lessons where YOU get to be the student will be combined with opportunities for planning and collaboration. Accrue 15 STEM clock hours, mileage and cash stipend. More information and registration here.